Artist’s impression of spacecraft for deep space NEO mission – (Credits: Digital Space). 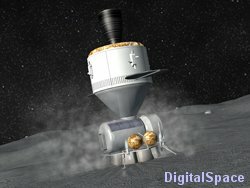 Digital Space, an international virtual design corporation, proposed a mechanism for conducting manned missions to Near Earth Objects (NEOs) such as asteroids (see video below). The key feature of these missions is a capsule capable of “docking” with a NEO. The gravitational field for NEOs is too small to allow for a proper spacecraft surface landing: therefore the docking capsule would be equipped with a sensor-laden ring of air bags alternating with penetrometers. The air bags permit a soft contact with the NEO surface, while the sensors and penetrometers assess the security of the touch-down surface. If the surface is deemed acceptable, the astronauts would initiate a harpoon maneuver to anchor cabling into the NEO’s surface. Astronauts, or in this case NEOnauts, would only be able to EVA within reach of the docking capsule, due to the low-level gravity evinced by NEOs and the scuba diver-like surface movement it would engender in spacewalking humans. The underwater motion analog to this gravitational level is one of the reasons aquatic bases are being explored by space agencies for NEO training missions. Digital Space has proposed development of jetpack technology to permit independent individual maneuverability. The NEOnauts would be able to “hop” the docking capsule across the surface of the NEO in order to explore and sample over greater distances. The tethered base of the docking capsule could be released and left behind on the NEO for continued robotic monitoring upon departure.